Xi said Ethiopia is an important partner of China in Africa, and the two countries have established a comprehensive strategic and cooperative partnership. 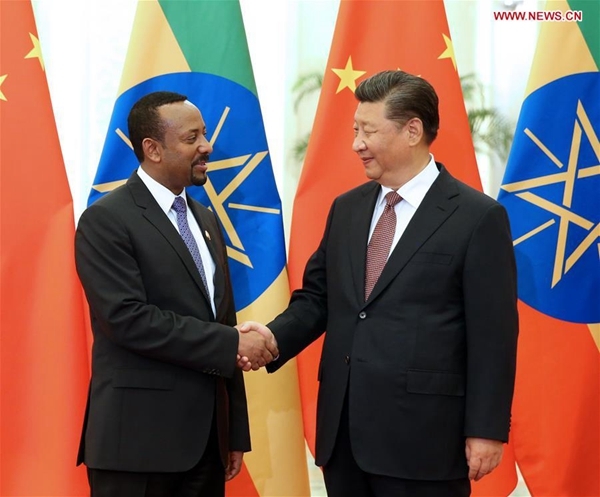 China supports Ethiopia in pursuing a development path suited to its own national conditions, appreciates its active participation in the building of the Belt and Road, and is willing to maintain the momentum of high-level exchanges, deepen mutually beneficial cooperation in various fields, support each other on issues involving respective core interests and major concerns, strengthen communication and coordination in international and regional affairs, and safeguard common interests of both sides as well as other developing countries. Abiy said China is a reliable friend in the course of Ethiopia's development, and China's precious assistance has always been crucial to his country's economic restructuring and achievements. He thanked China for its massive support. Ethiopia cherishes the mutually beneficial cooperation between the two countries, and hopes to learn from China's experience in governance, deepen the bilateral relations, actively participate in the building of the Belt and Road, broaden bilateral exchanges and cooperation, and strengthen coordination in international affairs, Abiy said.